Bret Michaels Facebook Fan Page has made another update today regarding the condition of Bret Michaels. And this time, they referenced a website for people to visit for updates. The website BretMichaels.com was referenced, but when I went there, the site was down. This was perhaps caused by a huge increase in traffic, and the fact that the website’s server may not have sufficient bandwidth to handle to traffic spike. Once again we can’t thank everyone enough for all the well wishes and prayers being sent Bret’s way! As of now Bret remains in ICU under 24 hour surveillance. Further testing this week will help locate the source of the bleeding. 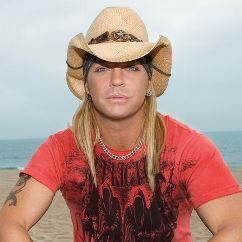 Look for an official medical report from doctors this week at BretMichaels.com. Please remember Bret is, and always has been, a fighter and survivor and is under the best medical care possible. Thank you for your support, thoughts & concern! So Bret Michaels is under continuous 24 hour surveillance and basically fighting for his life in the hospital. I am not a fan of your music.. never heard of it.. sorry.. I am a almost 50 yrs old. woman. saw your show where you were looking for a girl.. and something about you just seem to stay with me.. so.. with that said.. I am sending out my prayers.. to your family and formost to you…for some reason.. I seem to think that you have a guardian with you and it is not your time.. sorry.. but the man up stairs have bigger plans for you…I will listen for the news to tell me that you are getting ready to go back home.. I am having my daughter write this to you because I am a blind juvenile diabetic since I was 18 months old. I used to see you and love your music and I have your Cd's. I am so glad you survived the brain hemorrhage, and my family prayed for you. I really like your daughters' names, my daughter's name is Sabrina. She will be 12 years old soon. I used to have your posters and I think you are cute and so does my grandma think you are cute. I am 36 and would like to talk to you about our diabetes. Do you have any complications from the diabetes? Please contact me at [email protected]. Take care….From, Tammy & Sabrina ROCK ON!!!!! I am the daughter of the blind juvenile diabetic that I wrote for. My mom got me into your music, I think you are cool, and that I am glad that you survived the brain hemorrhage. Today on Oprah, I watched you and my mom listened to you. Please contact me at [email protected]. Take care of yourself…From, Sabrina ROCK ON!!!!!!! god bles you and yor family been there and still there for seven years plus i have 9 yr old it gets betterbefore it gets better before it gets worst loveyou snd god bless keep looking up he’s looking down.